This image shows the Bay of Bengal, the Indian subcontinent to the west and Indochina to the east. 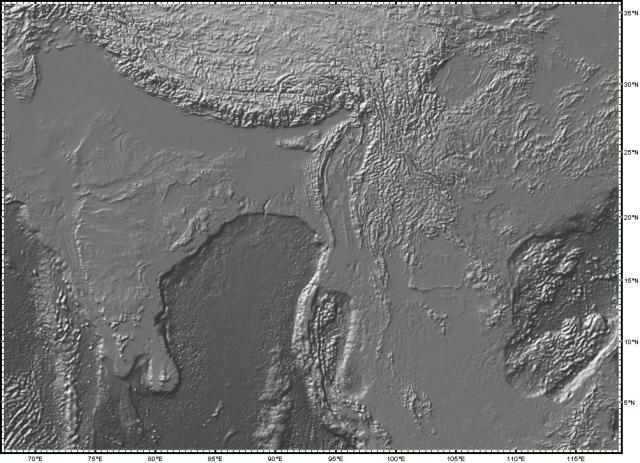 In the black and white image, the boundary between land and sea is blurred, emphasizing the roughness of the Himalaya mountains in the north and the undersea topography in the Andaman Sea near Indochina. It was along this plate boundary, near the tip of the island of Sumatra, that the December 26, 2005 earthquake ocurred, causing a major tsunami and loss of human life. In the color image, note the way the sediment, washed down from the Himalayan highlands by the Ganges River, has filled and smoothed the floor of the Bay of Bengal, forming the Bengal Fan.